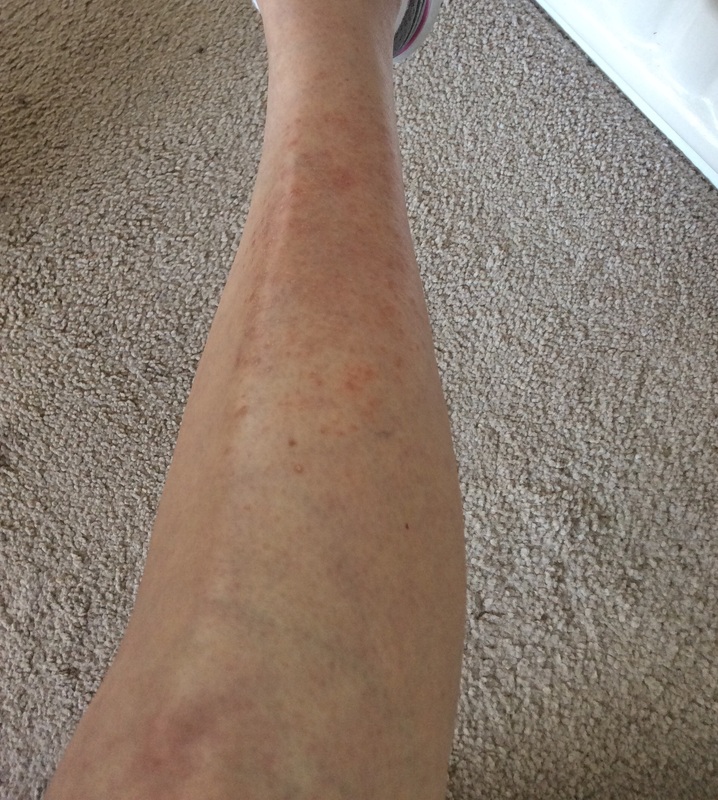 Today I’m going to talk skin diseases, rashes and juicing, so if you are of a squeamish disposition look away now! In late January 2015, I finally succumbed to a nasty flu-like virus that had bowled out every family member over Christmas. I was last woman standing and thought I had got away with it. I was juicing ginger and turmeric like there was no tomorrow, which is why I believe I held off for so long. But I became worn out coping when my husband fell ill and worrying about my daughter who had developed pneumonia. The virus found a weakness and struck me too. 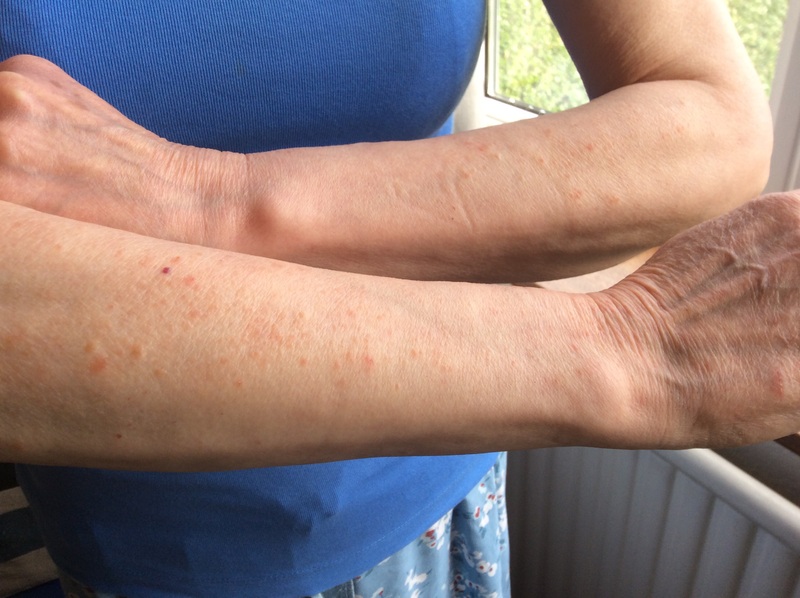 In late February, I noticed small, raised blotches appearing on my right forearm, which, over several weeks, became about a 10cm patch. One or two developed on my left. Then two or three patches appeared on my left calf. A major breakout came on my right calf. I ignored them to begin with. 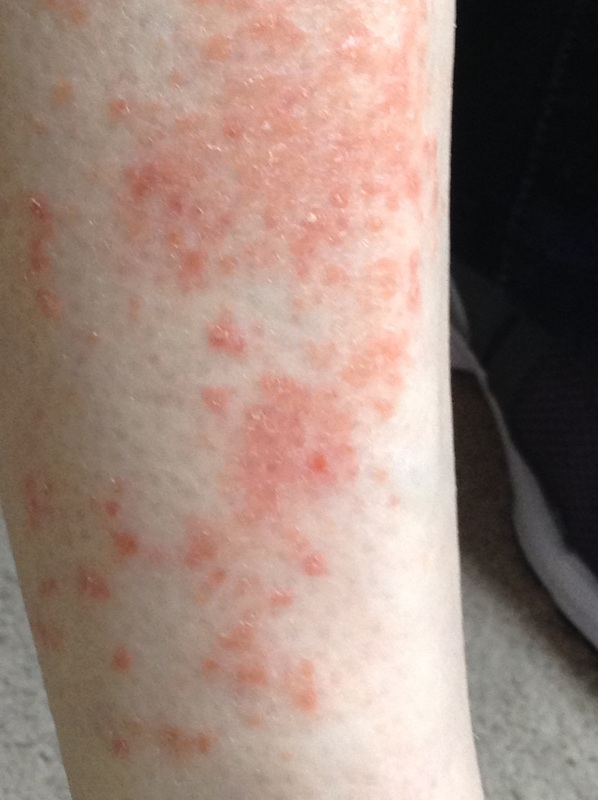 I’ve always had itchy skin, but this was new, I thought it would go away after a while. It didn’t. I googled it and discovered there are 67 different rashes! Over the next few weeks, the itching became unbearable. I was able to control the urge to scratch during the day but would wake up in the night with my leg bleeding. So why didn’t I go to the doctor? It’s what I would advise my mum to do. Well, firstly I react very badly to drugs and chemicals; secondly, from previous experience with a small patch of eczema years ago – and from the experience of other sufferers – I knew they would probably want to give me steroid cream, which I didn’t want to use. I wanted to tackle the cause, not just apply topical cream and suppress the symptoms. I believed that my body was still continuing to detox due to regular juicing and was probably placed under further strain by the virus. Detoxifying can go on for quite some time when juice cleansing and my body had lots to cope with before I began in terms of long-term pain and asthma medication and so on. The skin is a major player in detoxification, especially if the liver and kidneys are already taxed, and I wanted to encourage this process rather than suppress it with steroids. I turned to the juicing community for help. Jason Vale’s* struggle with psoriasis – an auto-immune disease – is well-documented in his books. When nothing worked, his doctors wanted to hospitalise him and cover him in coal tar and bandages for several weeks. 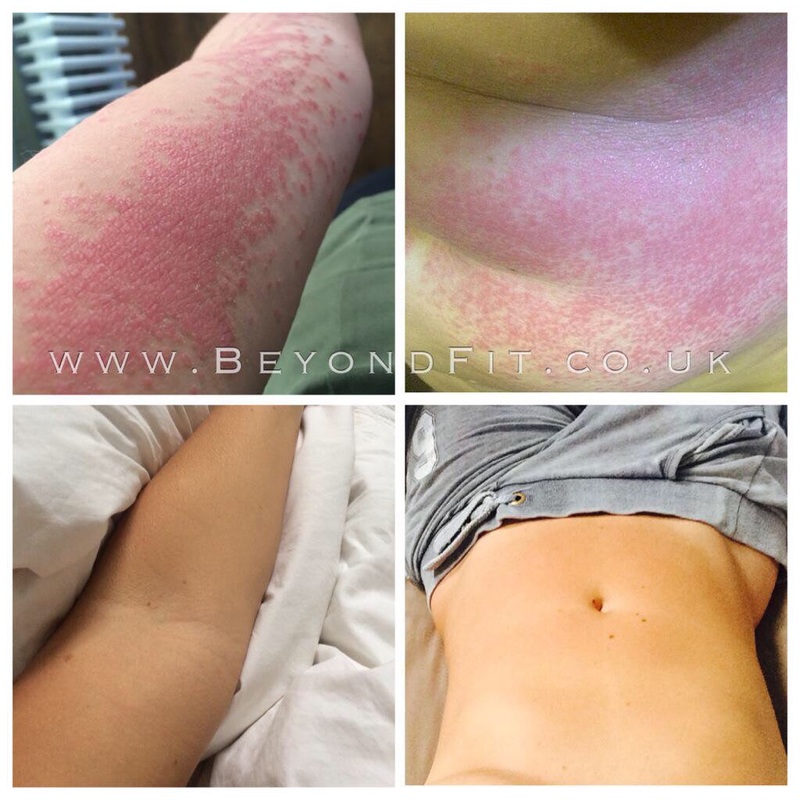 Hanna Sillitoe of My GoodnessRecipes* also had a body covered in psoriasis and her doctors wanted to give her chemo medication! Jason and Hanna decided to take a more gentle and natural route via juicing, skin-brushing, supplements, meditation, fresh air, exercise and essential fatty acids. They both became regular juicers and clean eaters and both now have clear skin. I decided to follow their example. I followed Jason’s Clear Skin Programme to the letter: specific juices for the skin and to support the body’s natural ability to repair and heal, plus Brazil nuts for selenium together with zinc for healthy skin, Omega oils, avocados, herbs to detoxify and Dead Sea salts for skin brushing to rid the skin of dead cells and improve circulation. I also did visualisation and meditation and smoothed Organic Raw Virgin Coconut Oil on the rash every morning and evening. The programme requires commitment and takes time, but it is well worth it. Jason warns that although some people begin to see benefits almost straightaway, for some it can take weeks or even months, but perseverance will win through in the end. He was right! I noticed an improvement within 10 days. It took less than a month for my arms to clear up altogether, and a bit longer for the small patches on my left leg. However, I began to despair over the much larger area on my right leg. But then in June, the whole area began to change to a lighter colour and the itching became less persistent. I could sleep and not be disturbed by it. I had a setback late July when my husband had a nasty cycling accident which created a lot of stress and exhaustion. 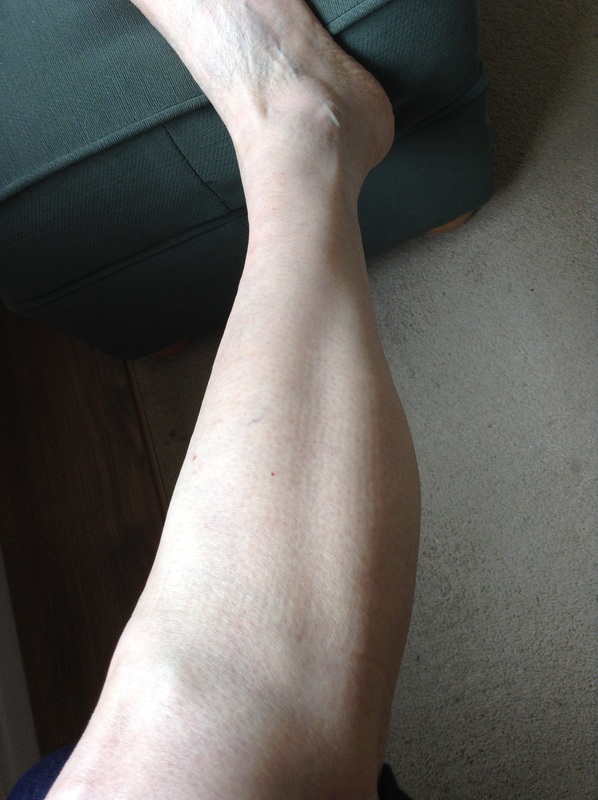 I became a little disheartened, thinking it would never go away, but I stuck with the programme and gradually it started to heal again until by September I was left with just a small patch on my shin bone. By October it had completely healed and cleared! No more itching and I can wear wool again, just in time for the cold weather! Result! Despite reading many medical opinions to the contrary, diet has apparently played a large part in the 3 of us regaining healthy skin and reclaiming our characters and our lives. My experience was nothing compared to Jason and Hanna’s, but it had begun to affect my personality and well-being. The moral of the story is: Don’t Give Up! Thank you to Jason Vale and Hanna Sillitoe for freely sharing their plans and providing support, for their inspiring positivity, and to Hanna for permission to use her photos. Both Jason and Hanna have free advice on their websites. PS 3 years on, I am still rash-free. PS Hanna has just had her first book published! ‘Radiant’ tells her story of how she cleared her skin through changes to her diet and lifestyle, becoming healthier and fitter in the process and also includes beautifully photographed recipes. Available on Amazon and at Waterstones. Disclaimer: This article is based on my own experience and reading about Jason and Hanna’s decisions to try juicing and natural treatments. Do your own research and please consult your doctor first especially if you are taking medications for your condition. Posted on December 1, 2015 February 21, 2018 by thejuicenutPosted in Essential Vitamins & Minerals, Health & Wellbeing, Juicing, Savoury Vegan Recipe, UncategorizedTagged eczema, Jason Vale, juicing, Mygoodnessrecipes, Nightshade foods and skin rashes, psoriasis, Radiant by Hanna Sillitoe, rash, Skin, skin brushing, treating psoriasis through diet and lifestyle. This is really interesting and great to be aware of. I don’t like using chemicals and drugs as well so I’m always looking for other solutions. Thanks for this. It’s my most popular post.